David Jeremiah said, "The greatest untapped harvest fields in modern America are our neighborhoods." Peter Frey "I dare say the day of door to door evangelism is over, and the day of next-door evangelism is here." 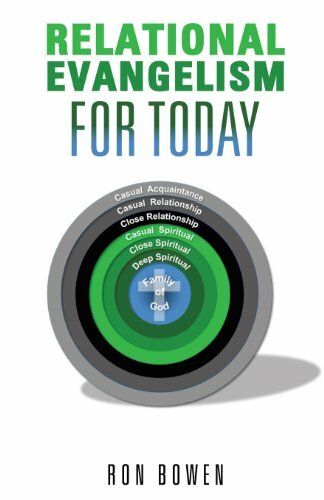 Bowen helps readers face the facts about evangelism - how things have changed, what works or what doesn't work and most importantly, the why behind it all. He shows we are all called to witness about the relationship we have with Christ and that we can do so effectively even if we are not pastors, speakers or leaders. Ron Bowen teaches an evangelism course at McLean Bible Church in Northern Virginia. Ron has a Bachelor of Science in Electrical Engineering and a Master of Arts in Biblical/Theological Studies from Luther Rice Seminary. He has been the Executive Pastor at Reston Bible Church and is now heavily involved in evangelizing, teaching, and discipling in his Haymarket, Virginia community. Ron and his wife Carol of 49 years have two children and four grandchildren.